The new Hastings United Football Club managerial team is hoping to complete its first significant signing in the coming days. United manager Garry Wilson and assistant Danny Bloor were appointed early last week, and the squad building efforts are already under way. Speaking yesterday (Thursday) morning, Bloor said: “I’ve probably spoken to about 15, 20 players at varying levels from various clubs. “One particular player has given us a verbal commitment and we hope to get him signed certainly by next Monday or Tuesday, hopefully over the weekend. Bloor said that he and Wilson are hoping to bring in some players from Lewes - where they worked together for much of last season - and unsurprisingly the squad is likely to contain a mixture of new and existing players. One particular player has given us a verbal commitment and we hope to get him signed certainly by next Monday or Tuesday, hopefully over the weekend. Bloor has spoken to quite a few members of the United squad which ended the 2014/15 Ryman Football League Division One South season and several meetings are arranged for next week once Wilson returns from holiday. While Wilson will be a familiar face to much of The Pilot Field faithful following his previous association with the club (then known as Hastings Town) in the late 20th century, Bloor is a complete newcomer to United. 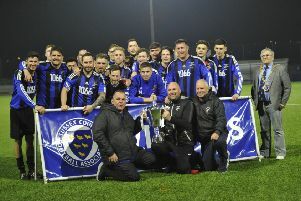 The Uckfield-based 45-year-old has previously managed Burgess Hill Town to the Sussex County League title by a record number of points, been assistant manager and manager at Worthing - who he led to the Ryman Division One South play-offs twice, and managed Eastbourne Town to their highest ever league position. Bloor, who works in sports promotion, regards United as having the best pitch in the east of the county.